I know it's been a very, very long time since I've updated this blog, and I do apologize! We seem to be busier and yet have less to talk about (or less that I feel is interesting enough to talk about). I'm going to try to be better about at least posting pictures for the Grandparents and family who are far away. 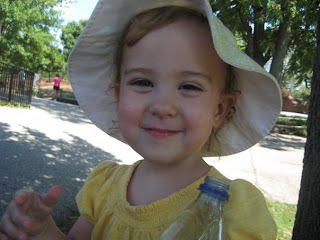 Adele is almost 3 years old--I can't believe it! She's amazing and smart and SO funny. She's a joy to be around. I can't believe how big she is. We're interviewing preschools this week and next, and that blows my mind. 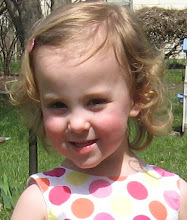 To think she was once a tiny, tiny baby and now she's old enough to go to preschool. To think we once didn't know if she'd have disabilities or learning problems or if she'd even be able to go to school. She's a miracle and I remember that even more the older she gets! As for Steve and I, we are both fine. I started a new job in December (after I'd gotten laid off in late Sept). It's going well, but I have a long commute to Lenexa. But I am thankful to have a job--period--let alone one that pays decently, has benefits and is something I enjoy. Steve is still at The Toy Store and enjoying that. It's a lot of work, but he has as much fun as he can! In October, we got a new dog. Yes, our dear Skeeter had only been gone a month but we felt we were ready (and missed having a dog around) and we found a great one at the humane society. A sweet dog that's good with kids and isn't too crazy is too good to pass up! His name is Scout and he's a HUGE yellow lab. We're not used to a dog that's the size of a pony. But he's a good boy--most of the time--and fun to have around. One thing I appreciate about him is that he's forced me to get outside and exercise every day, which is something I'd been neglecting for quite a while. Since today is Easter, I thought I'd share some photos from earlier today. Which, by the way, was a GREAT day. Weather was absolutely DIVINE (complete opposite weather than what I remember of Iowa Easters). We had brunch at church, service at 11:00, a trip to the dog park for kite-flying (and a mudbath for Scout), home to wash the dog and blow bubbles, and now we're waiting for Easter supper to finish up. It was a fantastic day! I hope yours was, too! Finally, the update I promised weeks ago! Okay, I'll get the yucky news out of the way first... We put Skeeter to sleep a little more than a week ago (the day before Steve's birthday, unfortunately). It was a sad, SAD day, and such a heartbreaking thing to have to do, but he was very sick and there was no hope for him. He went peacefully and we were there to hold him until the end. We miss him so much, especially the happy, silly Skeeter he was earlier this year. What a good dog we had for 9 years. I cannot say enough good things about our vet, Dr. Tom Liebl, and the entire staff at Clinton Parkway Animal Hospital. They showed us so much compassion and support and shared in our grief when Skeeter passed. They're the best! Now for a better topic--sweet Adele. She is fantastic, and such a joy. I love this age (even with its tantrums and trials). Her little personality is so fun and funNY, and she already has a fantastic sense of humor. I don't have a lot of exposure to 2-year-olds, but she seems to be ahead of the curve when it comes to vocab/speech stuff. We received her 27-month questionaire from Early Intervention and one of the questions was if she was speaking in 3-4 word sentences yet. Uh, YET? Try for the past several months! We have to give an example, too. The hard part is narrowing it down to just one. Will it be "Momma! I need to go potty!" or "May I be excused, please?" or "See the big, blue bus, Mommy?" Decisions, decisions! Maybe this is all perfectly normal for this age, but I can't help but be amazed at her language/comprehension skills. It's probably because I know how far she's come and how different things could be. We still don't take much for granted! I think one of the last times I posted, I mentioned we were trying out potty training. I'm happy to report that early training was successful, for the most part! She's in big girl underwear during the day and rarely, if ever, has accidents. She's still in pull-ups at night and for naps, but I can live with that. We're still working on perfecting the, uh, second type of bathroom event, but that is getting better too. We reward each one of those successful trips with a Barney viewing, and since she L-O-V-E-S Barney, it's a great incentive. Last weekend we went to St. Louis for Steve's uncle's memorial service. It was a sad occasion, but it gave us an opportunity to see Grandpa and Grandma Buren, whom we don't see often enough. We sneaked in a trip to the STL zoo on Saturday, where the picture below was taken. The STL zoo is AMAZING, if you haven't been before. They've improved a lot of the exhibits/landscaping since we were there last time (at least 3 years ago), and it's definitely a world-class zoo. We rode the carousel and the train (and before we even started moving, Adele exclaimed, complete with scrunched-up face "I don't like it." She warmed up after a while), but she LOVED the sea lion show. She was fairly miffed when an older girl got called on to help with the show and she didn't get to go up too. Ah, it's so hard to be 2. This weekend we're going camping with my parents and my brother and his family. Luckily the weather looks like it should be decent (the rain chances have been removed, thankfully). I hope the little girls have a good time and aren't too scared to use the outhouse! Hopefully I'll have some fun pictures to share from this weekend's adventure. Enjoy what's left of summer--I know we will! There are a few things to report, one item not so good. Should I start with that first just to get it out of the way? Yeah, probably. You may remember that last year our dog, Skeeter, had his right eye removed because of a malignant eye tumor. He quickly recovered from that surgery and went right back to his usual, silly self. Earlier this summer I started noticing some on-and-off lameness with his right front leg, but just about the time I'd get ready to call the vet to have it checked out, he'd recover and start putting normal weight on it. He went in for his regular check-up in late June and all was well. He was overweight, which is normal for him, but otherwise healthy. The vet was happy to see that he was still doing so well after his bout with cancer last year. In less than a week after that check-up, a lump appeared on his right front-leg "wrist," and he'd begun favoring that leg so much he wasn't putting any weight on it at all. We also noticed that he wasn't eating much or at all, which was HIGHLY unusual. Skeeter had never met a food item he didn't like. We took him back to the vet, and the first thing we noticed was that he'd dropped 4 pounds--in less than two weeks. Yikes. The vet brought up the possibility that the lump could be a tumor, which was a thought that had crossed my mind, too. He put him on some anti-inflammatory medication to see if that would reduce the swelling and we waited a week to see how he fared. Unfortunately, there was little to no change to the size of the lump and his appetite never increased. Back to the vet yesterday for x-rays--he'd lost ANOTHER 4 pounds in that week and a half. The results from the x-rays were not what we were hoping for: A significant chance that there is a tumor growing there (probably osteosarcoma (bone cancer), since it's unlikely that it's metasticized melanoma from his eye cancer) with a slight possibility of a bone fungal infection (this would be extremely rare considering where we live). So, now we're faced with the high possibility that Mr. McWheeter has yet ANOTHER form of cancer, this time a very aggressive form that is generally incurable. In most cases, by the time a lump has formed and is obvious to the naked eye, the cancer has already spread to other areas. Our options at this point are 1) A biopsy of some sort to rule out the fungal infection or to diagnose that it is really cancer (and what kind) or 2) to skip that entirely and assume it's cancer (since the odds are in our "favor") and just let him be. The vet himself said he doesn't have much hope that it's NOT cancer. We're really wrestling with what to do in regards to a biopsy. It would be nice to know for sure what we're dealing with, but the most accurate biopsy is a fairly invasive procedure (requiring full sedation) and can cause weakening of the already compromised bone, which in turn could cause a fracture or some other injury to that leg. We had already decided that if it WAS cancer, we would not be doing treatments of any sort. With me losing my job in a month, there's just no way we could afford ongoing chemo treatments. I hate to automatically assume the worst, and I would HATE it if it really was a treatable infection of some sort and we didn't even try to fight it, but let's be honest here--we're not made of money, and this guy has already survived malignant cancer once in his 9 years. Is it really practical or humane to drag this on any longer than necessary? So yeah, Steve and I have a lot of tough decisions to make. Our vet is fantastic and let us know in no uncertain terms that we have already done more for him than a lot of pet owners would and that our concerns (financial and otherwise) are valid and we would NOT be bad people if we chose to stop the fight. Right now, Skeeter is on some pain/anti-inflammatory medicine while we decide the next course of action. I bought some canned food that he will eat a bit of (enough to get his medicine down, thankfully), but I can tell he's not the same Skeeter he used to be. It's just hard to have to decide if/when the right time is. Do we wait until it's obvious that his body is failing or do we do it sooner, before he suffers any more? This is one of the times I wish Skeeter could speak in words, so that we knew what HE wanted. We want to do what is right for him, so that he has the best life possible, as long as possible. But Steve and I are struggling with the guilt that comes along with making a decision that may seem (to others) based on inconvenience or cost alone. You know? It's hard. I knew this decision would come someday--it's one that every pet owner has to face at one time or another--we just weren't ready to have to make it now. Yeah, so I know I still haven't put up a recap and pics of our Boston trip. I will try to get those someday, I promise. It's just that we've been distracted lately, what with me getting the news that I'll be jobless at the end of August. Oh, good times. Goooood times. But hey, things can always be worse, right? We'll be okay. I've been through the layoff process once before (and it was with the same company--ha ha! ), so it wasn't as earth-shattering this time. Of course our situation is different now--a mortgage, a child--but I also feel like we're in a better place mentally and financially. We're not rich, but we take better care of our money now than we did years ago so I feel like we know how to make it work during tough times. We also have some irons in the fire as far as replacement incomes. I decided I would like to stay home with Adele for a while and think about "what I want to be when I grow up," since I think it's safe to say that I'm done with publishing for a good long time. We're in discussions with a friend to watch her daughter part-time, which will bring in a bit more income, but there's still a gap that we'll need to fill. I won't bore you with all the details until I know that things are finalized. I do belive wholeheartedly that we'll be fine. I believe things always work out for the best--I don't know if that makes me an optimist or delusional. Ha! Since this is a three-day weekend for me and I'll have all day Friday and Saturday at home with Adele, I THINK I may run and get her her first pairs of training underwear today. Figured this is as good a time as any to try some full-on potty-training. We'll take the diapers off and go free as a bird, and hopefully she'll get the picture. If not, no harm, no foul. We'll wait and try again later. Next week we will go to Kansas City to see NICU nurse Lauren get married! I'm so excited to see Lauren and show off Adele to her--it's been more than a year since we've gotten together. Hopefully I'll get a few good pictures to share. I hope everyone has a safe and fun Forth of July! 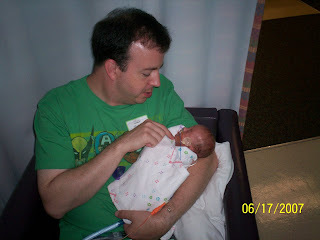 And because I love a good trip down memory lane, here are some photos of Steve's first Father's Day. ADELE POTTIED IN THE BIG POTTY TODAY! Yay!!! She then promptly peed on the floor but hey, SHE WENT IN THE POTTY! Woot! We celebrated with lots of clapping and praising and a jellybean. :) We have a lot of work ahead of us, but I'm so happy she finally went in the potty. Whew. I plan on having a bigger post in the near future recapping our Boston trip and some other stuff, so stay tuned!